The medical term for the big toe is “Hallux.” Hallux Rigidus then is the loss of motion to the big toe joint. 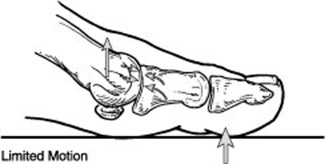 The big toe should have a normal range of upward (dorsiflexion) motion of 50 to 90 degrees for normal function. The big toe is an integral part of gait and the propulsion of the body forward when it flexes upward and pushes off the ground. With limited motion, the big toe will not propel the body forward and other joints of the body will need to compensate, putting more strain through the rest of the foot and lower extremity. This will lead to an inefficient gait pattern and increased fatigue and pain. Over time, the decrease in motion will lend to jamming of the joint. As the joint undergoes constant trauma in this way the bones become stimulated and extra bone growth occurs over the top of the joint. Eventually the joint cartilage will become eroded leading to arthritis (degenerative joint disease) and even less motion and more pain. The pain then is really caused by the remaining amount of motion. Now that the joint has become arthritic, any motion will cause increased pain. Because hallux rigidus is a progressive condition, the toe's motion decreases as time goes on. In its earlier stage, motion of the big toe is only somewhat limited—But as the problem advances, the toe's range of motion gradually decreases until it potentially reaches the end stage of "rigidus"— where the big toe becomes stiff, or what is sometimes called a "frozen joint." Other problems are also likely to occur as the disorder progresses. Pain and stiffness aggravated by cold, damp weather. Difficulty with certain activities (running, squatting). Swelling and inflammation around the joint. Difficulty wearing shoes because bone spurs (overgrowths) develop. Wearing high-heeled shoes can be particularly difficult. Dull pain in the hip, knee, or lower back due to changes in the way you walk. Hallux rigidus can be as a result of genetics or overuse. If there is a genetic predisposition to limited motion in the joint, the eventual arthritis will cause pain and decreased function. Other patients will develop arthritis in the joint from trauma and or overuse injuries. This arthritis then will lead to limited motion and pain and decreased function. This becomes a continuous cycle of decreased motion, arthritis, extra bone formation, jamming of the joint and so on. 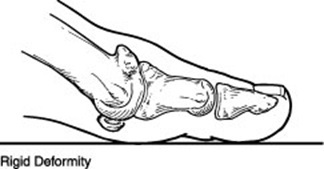 Common causes of hallux rigidus are faulty function (biomechanics) and structural abnormalities of the foot that can lead to osteoarthritis in the big toe joint. This type of arthritis—the kind that results from "wear and tear"—often develops in people who have defects that change the way their foot and big toe functions. For example, those with fallen arches or excessive pronation (rolling in) of the ankles are susceptible to developing hallux rigidus. Hallux rigidus can also result from an injury—even from stubbing your toe. Or it may be caused by certain inflammatory diseases, such as rheumatoid arthritis or gout. Clinical evaluation involves range of motion testing, gait analysis and thorough history of the pain and symptoms. X-ray evaluation is important to investigate the amount of joint narrowing and extra bone (spur) formation in the joint. The sooner this condition is diagnosed, the easier it is to treat. If you wait until bone spurs develop, your condition is likely to be more difficult to manage. Shoe modifications. Shoes that have a large toe box should be worn, because they put less pressure on your toe. Stiff or rocker-bottom soles may also be recommended. Most likely, you'll have to stop wearing high heels. Custom Orthotic devices may improve the function of your foot. Medications. Nonsteroidal anti-inflammatory drugs (NSAIDs), such as ibuprofen, may be prescribed to help reduce pain and inflammation. Supplements such as glucosamine-chondroitin sulfate and some vitamins and minerals may also be helpful. A: Corticosteroids in small amounts are sometimes given in the affected toe to help reduce the inflammation and pain. Physiotherapy. Ultrasound therapy or other physical therapy modalities may be undertaken to provide temporary relief. In some cases, surgery is the only way to eliminate or reduce pain. There are several types of surgery that can be undertaken to treat hallux rigidus. A cheilectomy procedure is used reconstruct and "clean up" the joint. We remove the arthritic damage from the joint as well as any accompanying bone spurs, This procedure is designed to preserve and restore normal alignment and function of the joint as well as reduce or eliminate pain. A decompressive osteotomy for symptomatic hallux rigidus is a good procedure for arthritic and degenerated first metatarsophalangeal joints where there is a long 1st Metatarsal. 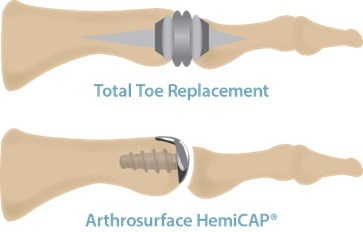 Advantages include increased range of motion, decreased postoperative pain, and rapid return to closed footgear. In severe cases, the great toe joint is fused. This removes all motion from the joint, but also removes all pain from the great toe joint. This procedure is reserved for severe cases with a great deal of pain and limited to no motion of the great toe joint prior to surgery. Recovery is 6 to 8 weeks in a boot with limited weight on the foot. Patients are mostly very happy with the outcome from fusion of the great toe as there is no more pain and they can return to their full activity. Hallux Rigidus is a form of degenerative arthritis that can develop for a number of reasons. Recognised by a reduction in the “movability” of the joint while both walking and standing and also while seated, this condition can occur due to a number of reasons. In the early stages, the joint may only be painful and have slightly limited movement, however as the condition progresses movement in joint will reduce, pain will increase and areas of hard skin and or changes in the way that we walk may occur. 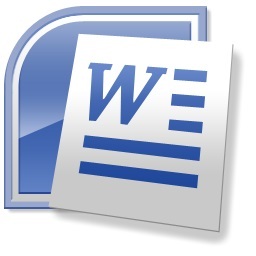 What causes HR to occur? HR can occur for a number of reasons. Frequently its just a part of the ageing process where cartilage in the big toe joint gets rubbed away and arthritic changes start to occur causing the ends of the bones to initially rub together (causing pain) and eventually to fuse. It can also occur as a result of trauma, whether that is actually breaking the joint or repetitive traumas such as kicking a football. Alternatively it might be the result of other disease processes such as gout or rheumatoid arthritis. Does HR have any associated risks? Typically it does not, however in some patients its really important to prevent unnecessary pressure being put through parts of the foot - such as in diabetic patients or individuals with neurological or vascular diseases where they are at a greater risk of ulceration. Otherwise, the main associated risk is just there being pain and the potential for hard skin to build up. HR can be diagnosed based on pain and clinical findings , however assessment of the joint may be done with x-rays, and assessment of how the joint changes have affected your gait may also be examined in a gait analysis appointment where computer software may or may not be used to detect how much pressure is going through your big toe joint. Use of X-rays is often helpful in staging the disease process and helping to decide on what kind of treatments might be used. 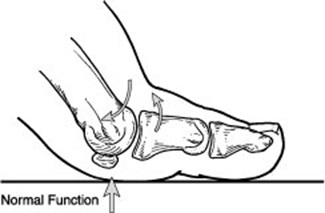 A later stage of HR may be treated conservatively with orthotics and footwear changes, or more aggressively with surgery to speed up the fusion of the joint. What can be done about HR? Viscosupplements generally a form of hyaluronic acid - act as a lubricant within the joint and prevent the bones from rubbing. Wearing a shoe with a rocker sole and a stiff base helps to prevent the joint from needing to bend while also helping you walk more normally. Surgery your options will vary depending on the severity of your joint disease, however this can all be discussed with me during your appointment. Sometimes a bump forms on the top of the joint, which when shaved down helps to let the joint move more freely and just prevent pain. 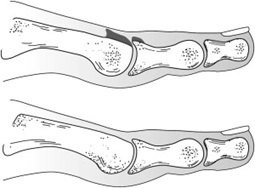 Alternatively procedures to either create a space between the bones of the joint, replace the joint with a new joint or fuse the joint may be performed. *Surgery is not one-size-fits-all and its often worth exploring more conservative options first before trying surgery.